The What: Hosa Technology has debuted its USB-300 Series SuperSpeed USB 3.0 cables. Featuring data transfer rates up to ten times faster than USB 2.0, new SuperSpeed USB cables are ideal for DJ’s, musicians, and audio professionals seeking to maximize the performance of their equipment, including portable disk drives, recording and playback systems, cameras, and more. 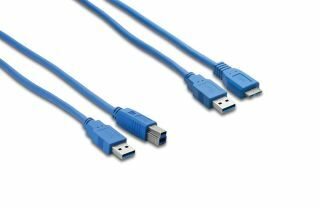 The What Else: Available in 3-, 6-, and 10-foot lengths, Hosa’s new SuperSpeed USB cables are available in two configurations: (1) the traditional Type A to B option commonly used to connect a PC to an audio interface, external hard drive, or similar device and (2) the Type A to Micro-B connector that can be found on DSLR cameras, smart phones, tablets, and portable drives. Regardless of the connector type, Hosa SuperSpeed USB cables are fully compliant with USB 3.0 specifications, providing transfer rates of up to 5 Gbps and increased power handling capabilities. All Hosa USB-300 Series SuperSpeed USB cables utilize Nickel-plated plugs for enhanced signal transfer and an Aluminum-Mylar shield for superior EMI and RFI rejection, making these cables an outstanding choice for connecting an audio interface, USB microphone or instrument, or computer peripherals to newer generation PCs.